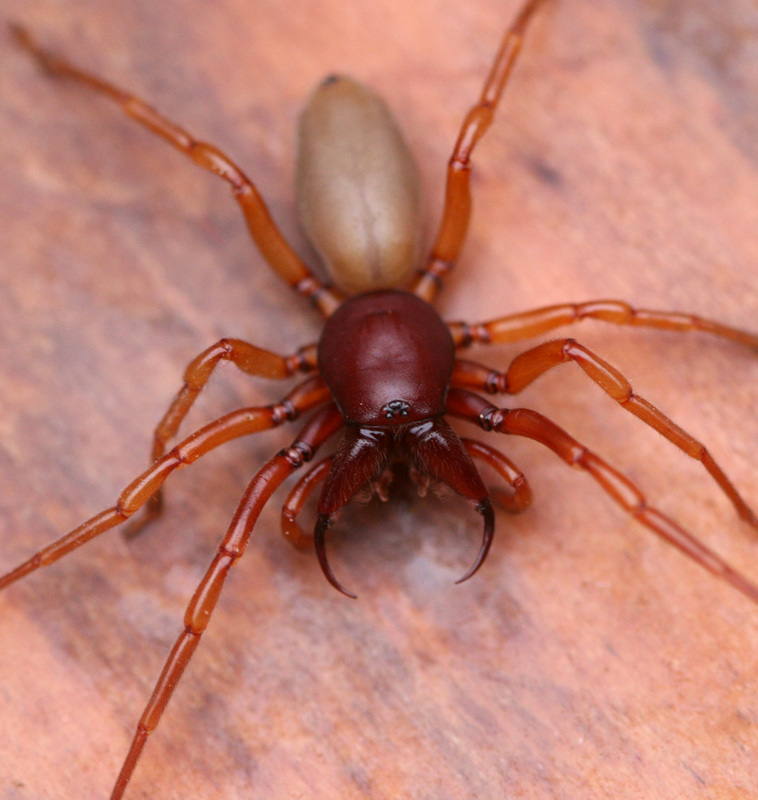 Slater spider Dysdera crocota, copyright Whitney Cranshaw. The Dysderidae is a western Palaearctic family of free-living spiders with large chelicerae, some of which have a predilection for hunting woodlice (Jocqué & Dippenaar-Schoeman 2007). Characters (from Jocqué & Dippenaar-Schoeman 2007): Medium-sized; six eyes present in compact group near clypeal edge; chelicerae and fangs well-developed; sternum joined to carapace by intercoxal sclerites; legs with two or three tarsal claws; distinct pair of tracheal spiracles posterior to booklung slits; ecribellate; haplogyne. [K55] Kraus, O. 1955. Spinnen von Korsika, Sardinien und Elba (Arach., Araneae). Senckenbergiana Biologica 36: 371–394. [PN01] Poggi, R., G. Nonveiller, A. Colla, D. Pavićević & T. Rađa. 2001–2002. Thaumastocephalini, a new tribe of Pselaphinae for Thaumastocephalus folliculipalpus n. gen., n. sp., an interesting new troglobious species from central Dalmatia (Croatia) (Coleoptera, Staphylinidae, Pselaphinae). Annali del Museo Civico di Storia Naturale “Giacomo Doria” 94: 1–20. [SL14] Samu, F., G. Lengyel, É. Szita, A. Bidló & P. Ódor. 2014. The effect of forest stand characteristics on spider diversity and species composition in deciduous-coniferous mixed forests. Journal of Arachnology 42 (2): 135–141. [VPB11] Varet, M., J. Pétillon & F. Burel. 2011. Comparative responses of spider and carabid beetle assemblages along an urban-rural boundary gradient. Journal of Arachnology 39 (2): 236–243.